The black light trap network is nearly complete at this time. To date, no corn earworm (CEW) have been captured. Increasing numbers of European corn borer (ECB) moths have been captured this past week, although numbers are still quite low. At present, the highest activity is in portions of northern Burlington and northwestern Ocean counties (see ECB map). This pest poses little threat at this time, as the earliest sweet corn plants are only just reaching suitable size to support larvae. 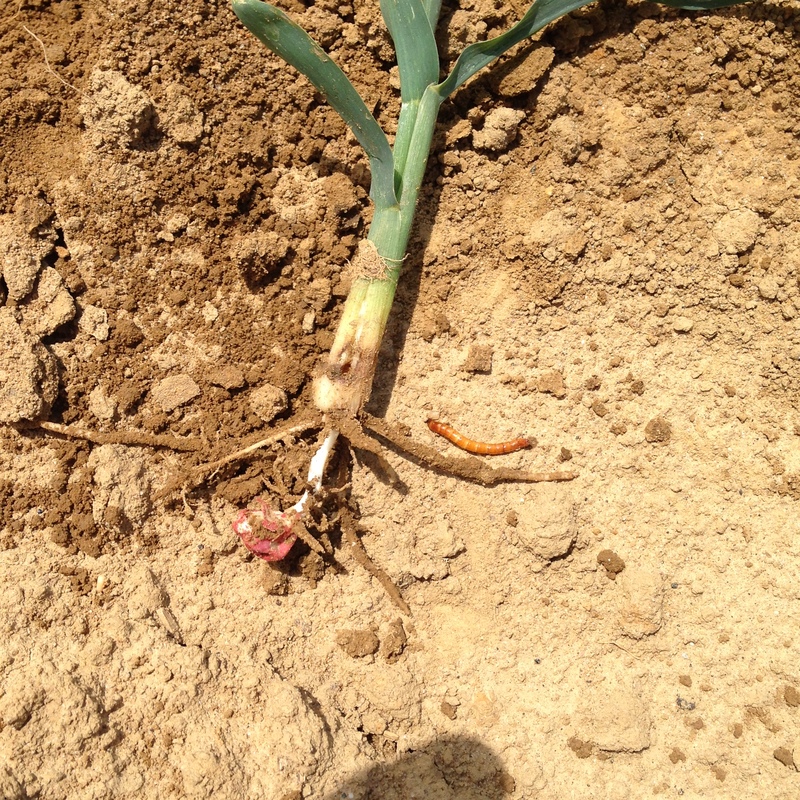 Wireworms may be a problem in any early sweet corn or field corn (see photo at left). Cold, wet springs are when we will have the worst damage from them. Though there is no rescue treatment for wireworms, farmers should check their corn plantings for damage so that they may estimate potential losses from this pest. 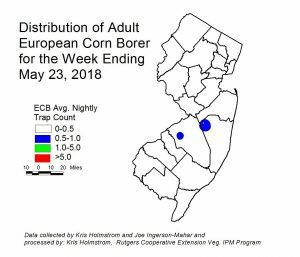 Very low levels of imported cabbageworm (ICW) and diamondback moth larvae (DBM) have been found in cole crop plantings in central and northern NJ this week. These infestations will increase rapidly as the spring season progresses. Check 5 consecutive plants each in 10 random locations throughout the planting, paying particular attention to the innermost leaves where ICW often feed. Consider treating if caterpillars are found on 10% or more plants that are in the 0-9 true leaf stage. From 9-leaf to the early head stage (in broccoli, cauliflower, and cabbage) infestations up to 20% may be tolerated. Once heads begin to form, a 5% threshold should be observed to protect the marketable portion of the plant. For leafy greens such as collards and kale, 10% plants infested is the threshold throughout. The IRAC group 5 insecticide, Entrust, is OMRI approved for organic production. Insecticides based on the soil-inhabiting bacterium Bacilllus thuringiensis (B.t.) may also be effective on caterpillar pests of cole crops. Examples include Xentari and Javelin. Flea beetles are very active in many plantings, particularly during the warmer days. These pests have a preference for the “hotter” flavored crops like arugula, mustard greens, and turnip greens. They also attack Tuscan or lacinato kale frequently. Plants may be protected with at-planting, soil-applied neo-nicotinoid insecticides (see the 2018 Commercial Vegetable Production Recommendations for products). An OMRI approved foliar material for flea beetle management is Pyganic. This product will provide knock-down of flea beetles, but may need to be applied frequently on preferred host crops. No new captures of allium leaf miner (ALM) adults have occurred on sticky cards. 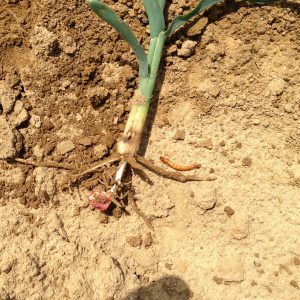 Damage, which had been increasing on early alliums seems to have leveled off as well, with only minor increases in feeding this past week at the ALM study plot at the Snyder Research and Extension farm in Hunterdon County. This first adult flight was late, due to the cold early spring. It now seems to be winding down. Only one weevil trapped in the past week at a processing facility in southern NJ. Pheromone traps have now been deployed at two farm markets where produce has been brought in from a terminal market. Field scouting of outdoor and high tunnel tomatoes has begun. As yet, no pests have been detected. Typically, aphids and two-spotted spider mites are the first pest problems to occur on high tunnel tomatoes. Growers should check these tomatoes at least weekly, and note the presence of mites or aphids. Mites in particular should be treated early, so that they do not build to a population that becomes difficult to manage.